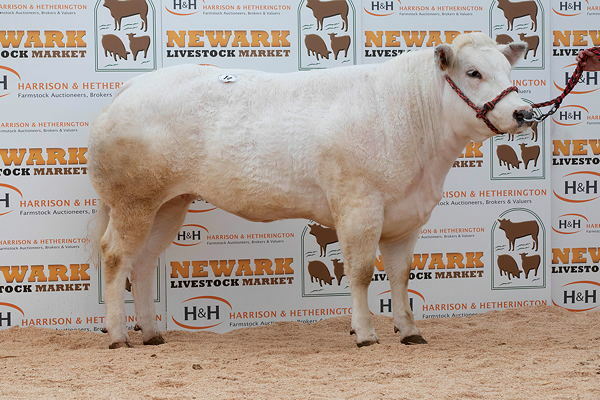 Harrison and Hetherington held their first British Blue Cattle Society show and sale at Newark Livestock Market on Saturday 30th March which was very kindly sponsored by Bowring Transport Ltd. The pre-sale show, judged by Mr Graham Brindley of the Bringlee herd, saw the Supreme Championship won by EA & DA Ellis with their February 2017 born bull Trencrom Masta Class. Masta Class was sired by Phenomene De Martinpre and out of the Bringlee Blackstar daughter Trencrom Ex Factor who has been a prolific breeder for the herd. 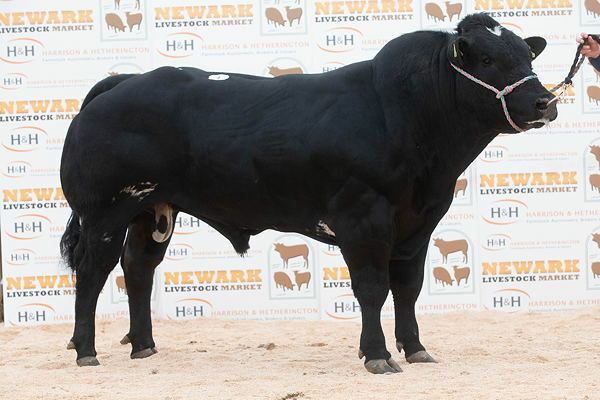 This bull went on to sell for the top price of the day at 4800gns to Lowesby Farms, Melton Mowbray. The Reserve Male Championship was won by V & G Bowring with Windmill Maximus. Maximus was sired by 16,000gns Gass Iron Man and out of Tweeddale Dark Beauty, a Henlli Wishmaster daughter. Maximus sold for the next best price of 4500gns and was purchased by Messrs Key from Norwich. 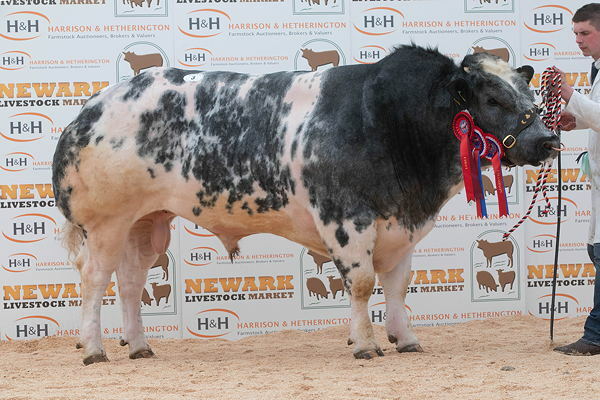 JA Hopkins sold two bulls both for 3800gns, the first of these was the 1st prize winner Delhorn Malcolm. Malcolm was sired by the Empire D’Ochain son Tweeddale Discovery and out of Tweeddale Fussy. The successful bidder on this occasion was Messrs Mason from Kettering. Also at the same money and bred the same way was Malcolm’s ET brother Delhorn Monster who was purchased by Messrs Grantham from Skegness. Females topped at 3100gns for Trencrom Nobella who had won 2nd prize in her maiden heifer class at the pre-sale show. Also consigned by EA & DA Ellis who were responsible for the top price bull, Nobella was sired by Farouk De St Amand and out of Trencrom Heather Belle. She was purchased by Messrs Williamson from Bishop Auckland. The Female and Reserve Supreme Championship was also won by Messrs Ellis this time with the Coolbanagher Ivor daughter Trencrom Mercedes. Mercedes went on to be purchased for 3000gns by Messrs Drake from Bradford. The same vendor also sold Trencrom Molly Day at 3000gns. Molly Day was sired by Ballydangan Hectare and had won Reserve Female Champion in the pre-sale show. She was purchased by Messrs Feather from Keighley. W & M Seel’s cow Hooton Gypsy Queen sold with her Faughanvale Kracker sired bull calf at foot, Hooton Norman, for 2600gns to top this section. Gypsy Queen was sired by Fakir De L’Hez Kernai and purchased on the day by Messrs Husk from Dover.